My group has put out a paper, which was just accepted for publication into Physical Review D! This paper is a generalization of the same calculation I did for my PhD thesis, which I’m 2/3 of the way into a series of posts explaining. The third post is coming at some point, I promise. I’ll be traveling to two conferences to talk about this paper. 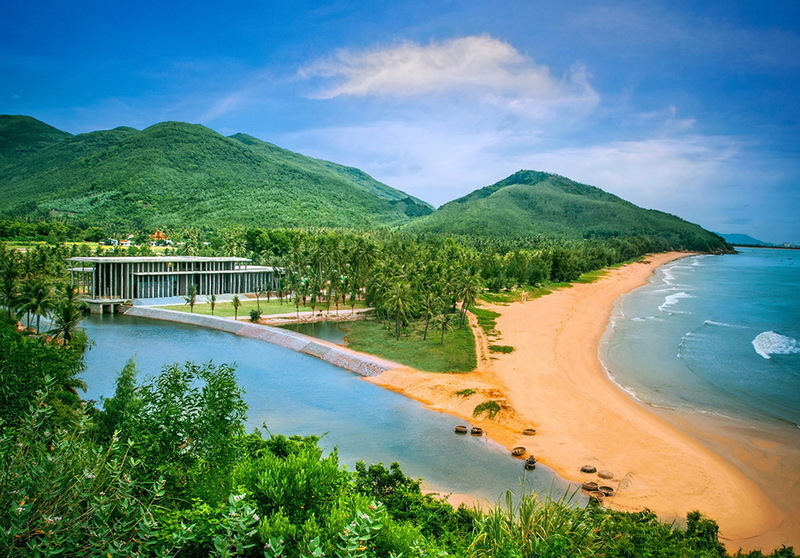 First, the Rencontres du Vietnam workshop on heavy ion physics, held at the brand new International Center for Interdisciplinary Science and Engineering (PDF), which is taking place next week. This is the first time I’ve been invited to present at a real conference! The venue also looks amazing. Every New Year’s Eve I do a review of my favorite blog posts from the past year. And normally I have too many good physics posts to make a top 10 list like so many other sites seem to do. But not this year. It’s been a pretty quiet year for blogging, especially for physics blogging (unless you count that one really big blog post they call a dissertation). 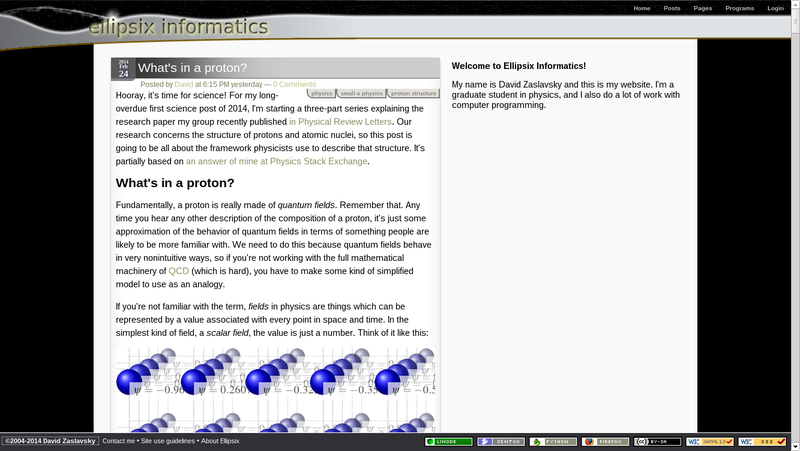 Therefore, New Year’s resolution #1: write more blog posts about interesting physics. This is one I actually think I can keep. For now, here is a short list of my favorites out of the 32 blog posts I wrote this year. Hooray, it works again! It took about 3 days of frantic hacking in the free time I had left over from research, but my website is back up and working properly (so it seems) on the new server. More blog posts to come, when I have time. Soon, I promise. The (virtual) computer this site runs on is showing its age, so I’m switching over to a newer one within the next day or so. Just so you know in case you have any trouble accessing the site. While I’m on the subject, kudos to Linode for having a very solid migration plan and for making continual upgrades to their hardware while lowering prices. The new server costs about a third as much as the one I’m using now. It’s been three months since my last blog update. Writing a dissertation really doesn’t leave time for anything else! Thankfully, it’s now done, so I can get back to posting cool physics stuff any day now. In other news, this fall is the 10th anniversary of ellipsix.net! I started this site a decade ago, just after starting college, because I wanted a little project to tinker with building dynamic websites. Hopefully I’ll have time to put some special content up to commemorate the occasion. For now, I’ll be at the meeting of the Mid-Atlantic Section of the American Physical Society this weekend. I’ll be posting updates on Twitter if you want to follow. Ellipsix Informatics is on Facebook! I finally broke down and made a Facebook page for this site. There probably won’t be anything there other than blog posts, at least not for a while, but if that’s how you want to find out when I post new things, have at it! Later this year is going to be the tenth anniversary of Ellipsix Informatics. In celebration of that, I’ve been working on a brand new, brighter, theme for the site! And with the Science Online conference coming up this week, I’ve decided to roll out the first batch of changes: a new colorful header, more prominent featuring of the blog posts on the home page, and some playful changes to the color scheme. This is just a rough draft to shake things up, so expect to see more changes that refine the site’s style as the year goes on. Suggestions and feedback are welcome!